There will soon be an even bigger choice of Angry Birds apps for Android and iOS as we have just heard that Angry Birds Friends is to make the jump from the Facebook platform to mobile apps. As the installation numbers of Angry Birds Friends on Facebook has now risen above 60 million we suppose it was just a question of time. The mobile app of Rovio’s Angry Birds Friends was announced at a Facebook event being held in Finland and players will find it differs from the standard Angry Birds. The original was focused on single-player activity but Angry Birds Friends, as you might expect from the title, is way more encompassing and altogether more social. 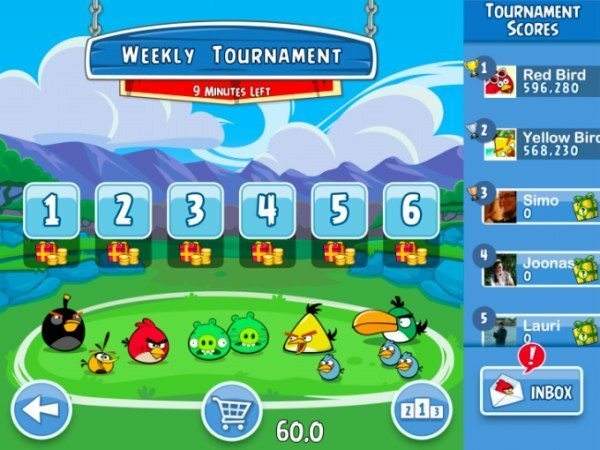 With Angry Birds Friends players can take part in weekly tournaments and vie for medals but there’s no mention yet on when the apps will appear at Google Play or in the App Store. On the Facebook desktop platform Angry Birds Friends currently has 15 million monthly active players in only one year since its release so bringing it to Android and iOS was inevitable. Rovio has done well from its humble first little pig-slaughtering game and just published its annual 2012 results that showed revenues of $195 million. Even more interesting is the fact that 45% of its revenues came from non-gaming business such as IP licensing for soft toys, books etc. Who’d have thought it! We’ll pass on further developments we hear about Angry Birds Friends for Android and iOS when we learn more. Will you be waiting to add to your Angry Birds mobile apps? Let us know with your comments.